Every gardener loves bedding plants because of the instant splash of colour they bring to the garden. Bedding plants are perfect for pots and planters, and are useful for filling in gaps where other plants are dying back or yet to mature. For rapid growth and an immediate visual impact bedding plants can not be beat. They are also great value for money. The majority of bedding plants are simple to grow from seed, but some of the smaller seeds such as begonias can be a little more challenging. A greenhouse provides a perfect environment for growing from seed, but a seed tray in a clear plastic bag placed in a warm sunny spot will also do the job. When potting or planting your bedding plants be sure to water them well, try to avoid damage by not touching the stem and use a plant feed especially when put in to pots and planters. Once they are planted they will grow rapidly, so continue to regularly feed them. 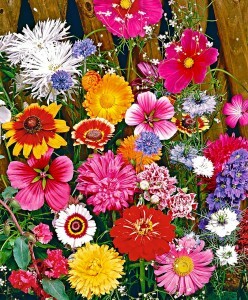 To encourage growth and allow them to fully blossom remove any flower buds that form in the first two weeks. When in bloom don’t forget to dead-head wilting flowers, as this will encourage further flowering. Popular bedding plants include begonias, geraniums, dahlias and fuchsias. For spring or autumn, bedding plants such as pansies and polyanthus are frost resistant. Others including marigolds and lobelia are best planted only in the summer as frost will destroy them.